Physician Career Satisfaction Across Specialties: Are We Getting the True Picture? The article by Leigh et al1 on physician satisfaction deals with a very important construct, "satisfaction," and is very informative. The data set is large and accounts for a large number of variables that affect physician satisfaction. However, we wish to raise some concerns regarding the interpretation of the data in the study. 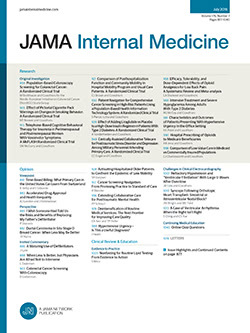 Income has been shown to be significantly and positively correlated with physician satisfaction in not only this study but also many other previous studies.2 While ranking the specialties on the "very satisfied" and "dissatisfied" categories, the authors have controlled for not only demographic variables but also an important variable such as income, which is dependent on specialty chosen. This has resulted in ranking physician satisfaction among specialties irrespective of what the earning potential of such specialties are. This might have resulted in spuriously lower rankings of highly sought after specialties such as ophthalmology, otolaryngology, cardiology, and gastroenterology and might also explain the discrepancy in rankings of this study compared with previous studies (in which income was not controlled).2 Career decisions regarding choosing a specialty by medical students and residents are not made in a vacuum but with keeping the earning potential of the specialty in mind. The ranking enlisted in the study by Leigh et al1 may not be able to give an accurate picture to them.